Isabella Anderson, 16, and Lauren Taylor, 16, work on a cardboard shelter. 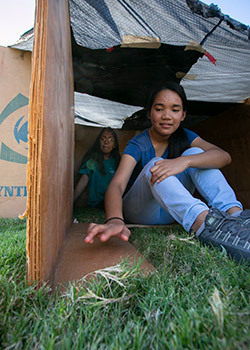 Members of the youth group at Our Lady Queen of Peace Parish in Wichita Falls built cardboard box shelters and spend the night outdoors to gain a better awareness of what homeless people endure, Saturday, October 27, 2018. (NTC/Rodger Mallison) Click here for the photo gallery. 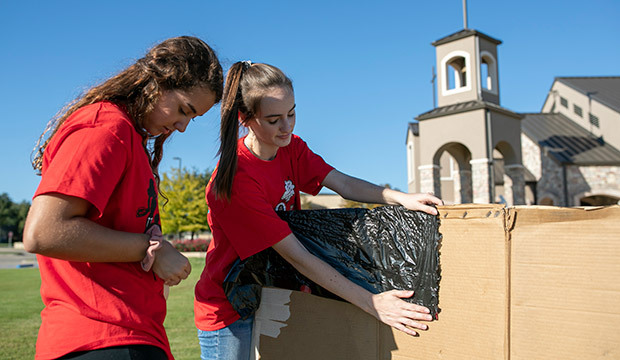 WICHITA FALLS — Heat, cold, hunger, and uncertainty were some of the challenges teenagers from Our Lady Queen of Peace Parish youth group faced as they lived in cardboard boxes and tents outside their Wichita Falls church for one night, in a gesture of solidarity with the homeless. 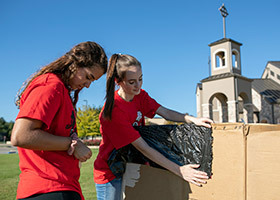 Renee O’Malley, youth ministry coordinator at Our Lady Queen of Peace, said the Night in a Box event is designed to bring awareness to the homeless for the teens. “To have them sacrifice one night without the comforts of home, like their warm beds, a table to eat their meal, and the safety of having a roof over their heads, and doors that lock,” she said. O’Malley noted that there were male volunteers who took shifts to watch over the group as they slept to keep them safe, she said. Six teens participated in the event that started about 3 p.m. on Oct. 27 with construction of their shelters and ended about 8:30 a.m. Oct. 28. “The teens had a great time building their shelters. They all pitched in and helped each other,” O’Malley said. She said they had two large shelters with a total of five girls, between them, and one small shelter for one middle school boy. “They all worked as a team to make sure everyone had a safe place to sleep,” O’Malley said. The group attended Mass together at the parish at 6 p.m. and had dinner afterward. Francis Anne Manning from Faith Mission, a Christian homeless shelter in Wichita Falls, talked to the group about the reality of homelessness. After the talk, the teens had some free time and played cards. “About 9 p.m., we prayed the Divine Mercy Chaplet in front of the Blessed Mother [statue] and dedicated the prayer for the ones with no bed to sleep in, the ones that didn’t receive a meal that day, and the ones that have no one to pray for them. It was truly beautiful,” O’Malley said. Camelia Modesto, a sophomore at Hirschi High School in Wichita Falls, said the weather made the experience difficult because it was hot during the day and they couldn’t shower, and at night it was cold. “I thought Night in a Box was something that changed my outlook on homelessness,” she said. “It did make me think about what it would be like to be homeless. It makes me think about how I should do well in school and not be out in the streets,” Modesto said. Modesto said it also made her think about how homeless people have little to no privacy and how it could take a long time for people who are homeless to be able to afford a home again.